A murderous, masked gang has moved into London, spreading terror through the criminal ranks as they take over the underworld. as the gang carves up more and more of the city, a single name comes to be uttered in fearful whispers. Professor Moriarty. When Tweed’s father is kidnapped by Moriarty, he is forced to team up with information broker Octavia Nightingale to track him down. But he soon realizes that his father’s disappearance is just a tiny piece of a political conspiracy that could destroy the British Empire and plunge the world into a horrific war. London in 1895, filled with steam and Tesla powered technology, never seemed so believable until Paul Crilley's Lazarus Machine. The first Tweed & Nightingale Adventure is everything one would expect from a science-fiction mystery: intriguing, speckled with humor, and riddled with danger for its endearing detective duo. Sebastian Tweed and Octavia Nigtingale are a force to reckon with and though they come from different backgrounds, their chemistry is undeniable and fun to see come to realization. Seventeen year old Tweed's father, a conman, is kidnapped in the middle of their latest job. The biggest suprise for Tweed is not that his father is taken, but that he's taken by a most feared criminal, Professor Moriarty. Moriarty was last heard of when he fell from Reichenbach Falls with the famous detective Sherlock Holmes, but he left behind a reputation for being a murderous criminal mastermind. On the posh side of town, Octavia, also known as Songbird, restlessly searches for her mother, who has been missing for a year. She focuses on finding out any and all information related to Moriarty which inevitably leads her to intersect paths with Tweed. Tweed and Songbird meld almost seamlessly into this evenly matched partnership to search for their missing parents. Their friendly bantering is natural and will make readers feel at home in their world. Tweed's mind is conditioned for deductive reasoning and compliments Songbird's knack for research and creating distractions. They make the most dangerous of tasks feel like exciting adventures as they delve deeper into what reveals itself to be a plot against the Crown, organized by the most powerful government agency - the Ministry. Usually when I think of steampunk, my first thought is: limited technology. Novels like The Lazarus Machine prove that a story set in a steam era doesn't always reflect a primitive lifestyle. Octavia admires the renowned Ada Lovelace, who's work with Charles Babbage is held in high esteem. Tesla towers are scattered all througout London powering computers and buildings. Crilley's most unique contribution to the steam era, though, is the streamline automata powered by human souls. The mechanics involved with the automata is out of this world and definitely not something I've read before. The ingenious creations don't stop there and as the story builds in action and discovery, the inventions become more ethically challanging and original. Crilley's fresh take on an alternate era will keep readers furiously flipping the pages and never knowing what's around the corner. The story progresses at just the right pace to keep you in the dark while cleverly developing in mystery. The direction of The Lazarus Machine is truly surprising and I love it's unexpected plot twists. I went from just enjoying the story to becoming entirely invested in its outcome and what's next for Tweed and Nightingale. 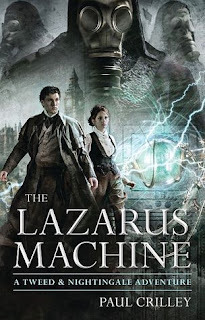 The Lazarus Machine is the beginning of an exciting and adventurous series that will rock your perception of mystery and steampunk! The Chosen of Gaia by M. Mariz - FREE on Amazon!